If you've ever wanted to see a "severe but survivable plane accident" (without worrying about actual lives at stake), tune into NASA TV today between 1 and 2pm ET. The site will be broadcasting live coverage of a simulated crash conducted by the agency's Search and Rescue Mission Office. 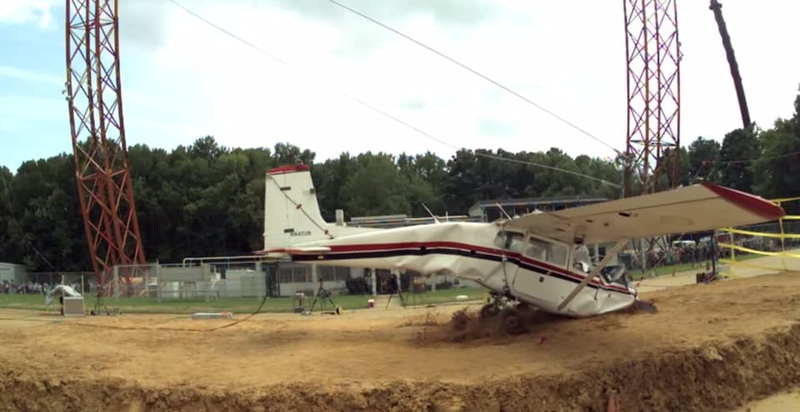 The crash test, which involves dropping a 1974 Cessna 172 tail-down from 100 feet onto soil, is intended to test emergency locator transmitters (ELTs) used by search and rescue teams. The ELTs installed in commercial planes and general aviation need to work even in the extreme conditions of an accident, which can include excessive vibrations, fire and impact. ELTs that survive a crash can send signals to orbiting satellites, which relay the data to search and rescue teams on the ground. The Cessna 172 being dropped in today's test is fitted with five ELTs, two crash test dummies (mmm mmm mmm), cameras and sensors to collect data which will be used to improve the ELT system. This will be the third Cessna that NASA has crashed; the first was dropped from 80 feet at nose level on concrete, and the second was dropped at 100 feet at nose level on soil. Visit NASA TV or this Ustream link to watch live.